When I started C25K, I didn’t go out and buy any special gear. I figured I’d wait and see if I actually stuck with it. 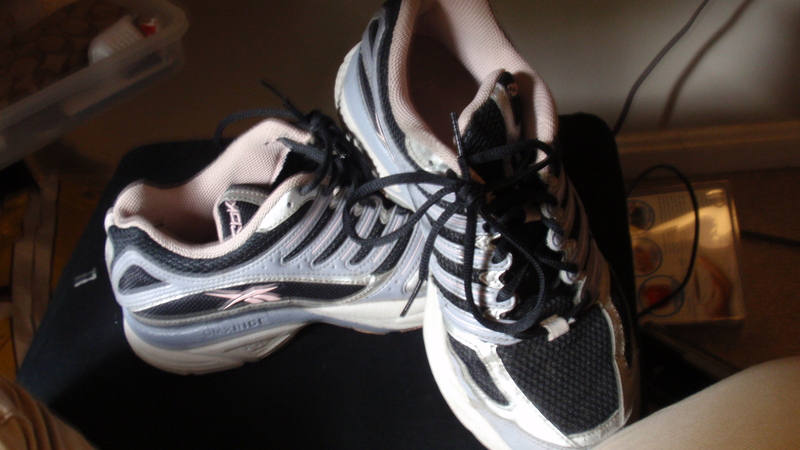 So I laced up my trusty Reebok sneakers, threw on my workout pants and a t shirt, and out I went. Last week, a very sad thing happened. I put on my sneakers for a run and felt something funny against my right heel. I took the shoe off and took a look. 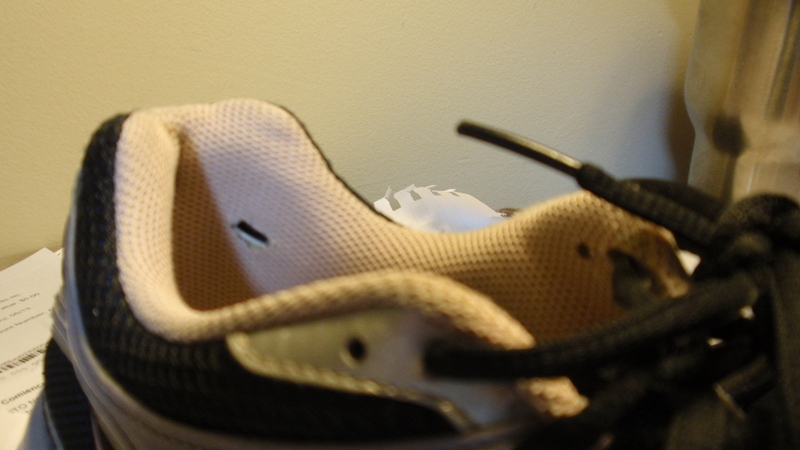 So, my heel had rubbed through the fabric in the back of my shoe. Sadness. 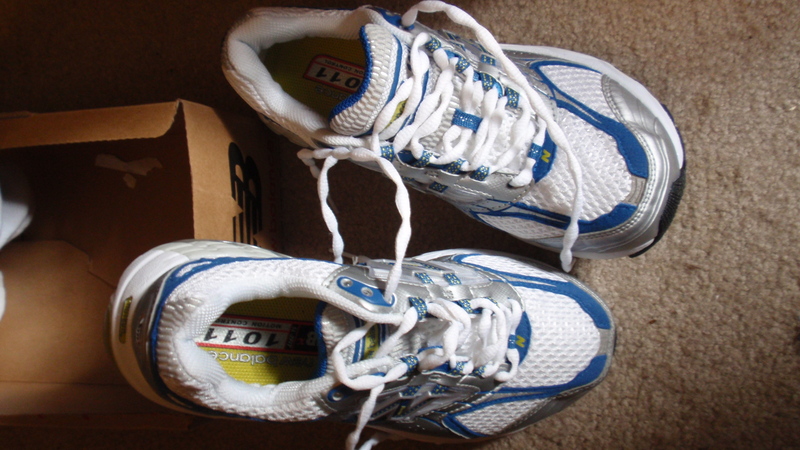 I knew I needed to go out and buy running shoes, but I also knew I couldn’t spend a fortune. So I went to my local shoe store. It is a nicer one that has that machine that analyzes your foot and also has sales associates who are specially trained to look at how you walk, etc., and recommend a shoe. The guy was uber nice and I told him about finishing C25K, how much I ran per week, how much I anticipated running in the future, etc. Apparently, because of my wide feet, my options are limited (read: expensive). He said normally for someone with my foot width, he’d go to a man’s size for more options, but I have short little feet, and men’s shoes would be way too big for me, so that was a no go. The first shoe he gave me was way too tight. The second was fabulous and I loved it. It was a New Balance and felt amaaazing. The price tag? $134.00. Ouch. Financially, it wasn’t going to happen. I know I need a decent pair of running shoes. I know it’s important to avoid injury and all that jazz, but I also have to be realistic financially, and right now I just can’t spend almost $150.00 on shoes. I told him this and he was really nice and understanding, and he brought out another New Balance shoe that was actually the predecessor to “the” shoe. It was also 50 dollars less, so I was totally sold. I also got a package of running socks which were almost $15.00, so the entire purchase cost me $103.00 with tax. Since I anticipate sticking with running, I am trying not to let myself feel bad about spending money on things like this. It’s hard, because I’ve really scaled back on my spending, and I feel much more in control over it, so I tend to feel bad when I buy things that I don’t see as absolutely necessary. However, I do have my little wish list. And I figure if I buy them one at a time, for special treats, maybe I won’t feel so bad about it. Polar F6 heart rate monitor. New sports bra. I have 2, but I’ve heard you’re supposed to replace them pretty regularly. iPod shuffle. Now, iPpy McSkinny is doing well but I keep dropping him. Now that I’m done C25K and don’t need the prompts for running/walking, I figure I can switch to the shuffle. My brother has loaned me his but I doubt he’ll let me take it to England.